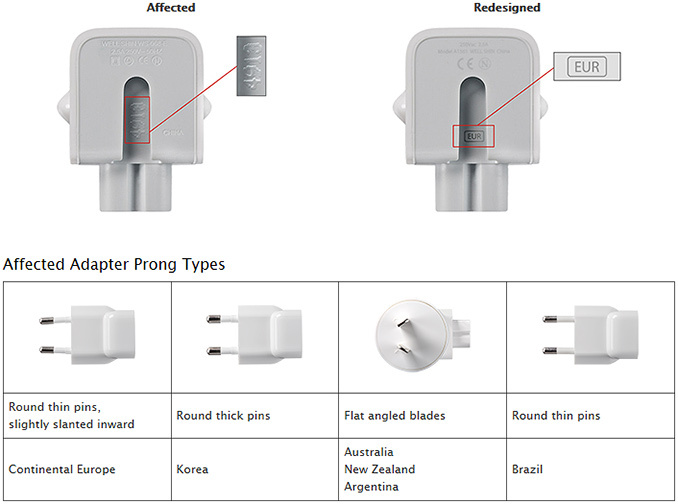 Apple has announced today that they are recalling AC wall plug adapters for its MacBook laptops and iPads in select countries. The issue stems from a design flaw that, if broken, causes the AC plug to pose a risk of electrical shock if touched. The adapters were shipped outside the U.S. from 2003 to 2015 and their total number should be rather huge. Nonetheless, the number of failures known to Apple is limited to 12 cases. Apple has found that its AC wall plug adapters (AKA "duckheads") designed for use in Continental Europe, Australia, New Zealand, Korea, Argentina and Brazil may malfunction and create a risk of electrical shock if touched. These wall plug adapters were bundled from 2003 to 2015 with Mac PCs as well as iPads. In addition, they were also included in the Apple World Travel Adapter Kit. The company will voluntarily exchange affected wall plug adapters with a new, redesigned model, free of charge. The affected wall plug adapters have four or five characters or no characters on the inside slot where it attaches to an Apple power adapter. The new wall plug adapters feature a 3-letter regional code in the slot (EUR, KOR, AUS, ARG or BRA). To exchange your device, you should visit a special page at Apple’s web-site. The Verge reports that Apple is aware of 12 incidents that have occurred around broken adapters in the past 12 years. Details of the incidents are unknown; their exact circumstances are unclear too. From 2003 to 2015, Apple shipped over 120 million Macs and over 230 million iPad. The exact number of devices sold in Europe, Australia, New Zealand, Korea, Argentina and Brazil is uncertain, but it is likely that many tens of millions of AC plug adapters are potentially dangerous. On the other hand, 12 incidents that occurred over 12 years is a miniscule number. Moreover, the vast majority of laptops, smartphones, tablets, phones and players that are more than five years old are no longer in use. Nonetheless, the recall will cost Apple millions of U.S. dollars. Meanwhile the AC wall plug adapters for the U.S., the U.K., Canada, China, Hong Kong and not part of the recall, which likely indicates that they aren't affected by the underlying issue. 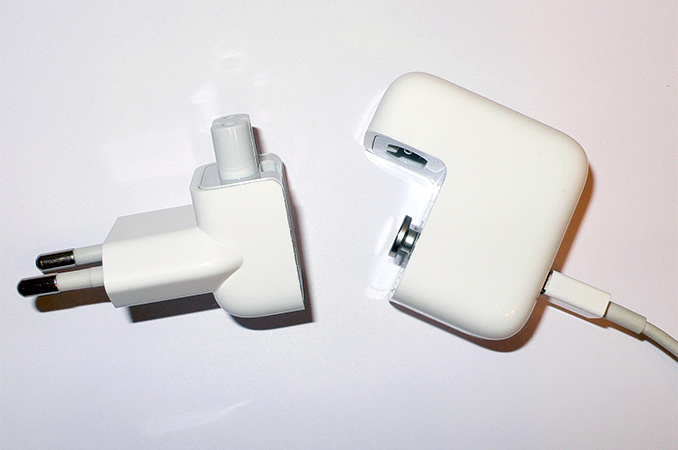 Finally, it should be noted that Apple's AC wall plug adapters are made by contract manufacturers, such as Volex. The same producers make similar devices to other suppliers of consumer electronics. Wait, so they're spending millions of dollars recalling adapters that are only dangerous if they are *physically broken*? One would assume that a physically broken adapter would no longer be functioning at the designed specifications in the first place. Unless it's a design flaw in and of itself causing these adapters to break, how can a product engineer be expected and responsible for designing around every possible unknown way an adapter can break? If you design a car that explodes every time it's broken a certain way and that normally it shouldn't because it's a design flaw. Should you recall that car because of that flaw or just ignore it? Seems about the same here, a design flaw that makes the adapters dangerous if it brakes in a specific way. Basic principles of Health and Safety law - your products should be designed, as far as possible, so that if someone does something stupid with them they will still be safe. That's the reason we call the things they put in place to ensure that happens "failsafes", not "failsplosions". Certainly in the EU there are regulations to say that if an electrical item breaks it should not short out, or catch fire, or give anyone an electric shock.